The Got Osimbo project springs from the Bright Hope World sponsorship of three agricultural workers from DOVE Africa to attend an intensive Foundations for Farming seminar in Zimbabwe. Building on the initial demonstration garden at Eshel Garden in Karen, Nairobi (KEN07a), DOVE Africa is now seeking to establish a further training centre in Got Osimbo. Francis Ogembo and Jesse Kilel were two of the people trained in Foundations for Farming and since being trained they have held several training events in this area and visited different regions to assist farmers implement the Foundations for Farming method. However, to date these training seminars have been sporadic and irregular and they now feel that a more structured approach which provides measured and tangible results would enhance the promotion and practice of Foundations for Farming. DOVE has also acquired 10 acres of viable land in Got Osimbo and is looking to establish a centre here for agricultural training. A farm supervisor will be based here to provide assistance to farmers on an ongoing basis and supervise farming of this land. This centre will provide support for farmers throughout the village and demonstrate successful implementation of the Foundations for Farming methods in the hope that this model will multiply in the region. BHW has been in dialogue with DOVE Fellowship for a number of years, exploring the most effective ways of developing a strategic partnership. There have been a number of meetings and visits to DOVE Africa sites in Kenya. 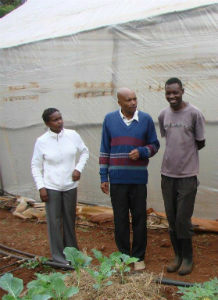 In 2012 three people were sent to the training in Zimbabwe and from that some strategies have emerged. The direct beneficiaries here will be the people initially trained by Francis and Jesse but indirectly this will eventually hopefully impact the whole community. DOVE Africa already has a great reputation in this community so there is the potential for this training to go viral and have a huge impact in a short space of time. 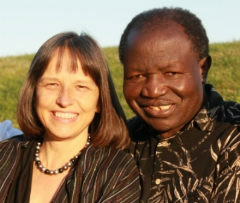 Ibrahim and Diane Omondi both serve on the DOVE International Apostolic Council. They have been ministering together in Kenya since 1984 and now oversee the work of more than 100 congregations in Kenya, Uganda, Rwanda and the Democratic Republic of Congo. They also give leadership to the missions thrust of DOVE Africa which includes 14 Kenyan and Ugandan missionaries serving among unreached people groups in these nations. The Omondis direct Springs of Africa, a non-profit organization sponsoring micro-finance, community development and various education initiatives. Ibrahim, a trained journalist and natural visionary, continues to dream about expansion and new territories. The most compelling of these visions is to establish a centre for training leaders who will transform Kenya – and Africa – from a continent of dependence and poverty to one of self-sustenance and hope. He served as General Secretary of the Evangelical Alliance of Kenya for several years and is still a board member of that organization. He was also a delegate to the National Constitutional Congress that worked on re-writing Kenya’s constitution and is a member of Kenya’s Anti-Corruption Steering Committee. Ibrahim actively networks with several intercessory groups and has led March for Jesus as well as other National Prayer Day events in Nairobi. Diane trains early childhood teachers and has written curriculum books for young children. She also enjoys teaching the Bible, leading worship, administrative work, handling accounts, and editing. Ibrahim (a native Kenyan) and Diane (American) are the parents of four children: three sons and a daughter who live in the States. Francis and Jesse are the two key implementers of this partnership. They will continue to oversee the project and train others to continue the training in this place. They were trained in Zimbabwe. Vision: To improve the farming methods in target locations in Kenya thereby enhancing food security and reducing poverty. Training Phase 1: The first phase is to revisit five locations where training has previously taken place (Nguluni, Nyahururu, Got Osimbo, Kisii and Kitale) and interview those previously trained so that a calendar for further training and follow-up can be put in place. They will identify specific farmers to work with in an ongoing programme (at least 3-5 farmers per location). Training Phase 2: Repeated monthly visits to each location for a period of six months. The proposed training involves both Francis and Jesse which means they will give more time and attention to doing training and follow-up. Training Centre: In order to support future sustainability of this training, they intend to develop the 10-acre plot as a farming business project, growing fruit and vegetables which will be sold at the local market. All of the farming will use Foundations for Farming techniques. It is envisioned that in the future the income from this farm will not only support the Foundations for Farming training component but also bring in finances to help support some widows and orphans in the community. The annual budget here provides funds for Jesse and Francis to conduct Foundations for Farming training in various surrounding areas.